Thanks to the technology we have today beauty lovers across the globe can access makeup tutorials and tips at the click of a button. Platforms such as YouTube, Instagram, and Facebook offer unlimited ways for beauty influencers and artists to showcase their knowledge and talent. Because of the surplus of knowledge on the web it’s often difficult for the average person to differentiate between “beauty influencers” and “professional makeup artists”. While these two roles are often blurred, artists and influencers are indeed different. Beauty Influencers (often referred to as “gurus”) are individuals who primarily specialize in trendy “social media makeup” application. They share makeup reviews and looks across various social media platforms and typically have a large number of followers. Although most influencers are good at what they do, they’re usually not professionally trained makeup artists. Examples of Popular Beauty Influencers: Jaclyn Hill, Manny MUA, Laura Lee, Kathleen Lights, Jeffree Star, Patrick Starrr, etc. What Are Professional Makeup Artists? 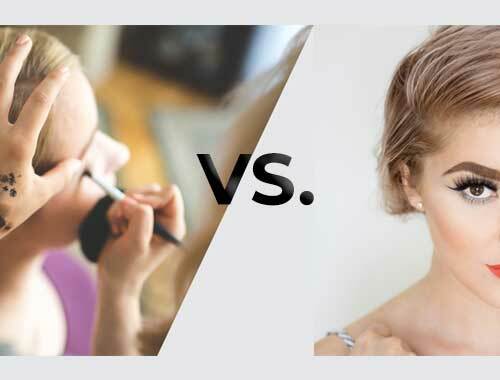 Makeup Artists are professionals who are paid to apply makeup to others, including brides, models, actors, etc. They have either trained in school or on their own time (depending on where they live) and have mastered advanced makeup application techniques & color theory. Since they work on multiple people, makeup artists are often required to carry a cosmetology or esthetician license (for liability and sanitation reasons). Examples of Professional Makeup Artists: Kevyn Aucoin, Lisa Eldridge, Bobbi Brown, Pat Mcgrath, etc. As the name suggests, beauty influencers encourage fans to try and buy popular consumer beauty products. They review the products and/or demonstrate how to use them in social media videos, pictures, podcasts and blogs. Many consumers use the influencer’s material to decide whether or not they should buy an item and/or how to use it. When Influencers rave about an item they love it “influences” others to want to go out and buy it, yielding a large amount of traffic for the brand. Because of the huge social impact influencers have, cosmetic companies sometimes pay them to talk about and/or endorse their product. It’s also common for brands to send influencers product for free in hopes they will share it on social media. Although a good portion of influencers are honest, some consumers fear the reviews may be skewed if the influencer is being paid or sent free product. Instead of focusing on social media, makeup artists focus on building their clientele and portfolio. On an average day, artists travel to a specific client or set to apply makeup on models, actors, celebrities, etc. A majority of their work is done for movies, TV, magazines and celebrity events. Makeup Artists usually don’t create as huge of a hype for certain beauty products as influencers do, however they typically have a better understanding of the product and how it should be applied. Just like influencers, some artists may receive free product from cosmetic brands. Beauty Influencers tend to create looks that are considered “heavy”, using techniques that are typically inspired by drag makeup. This includes full-coverage foundation, baking, full eyebrows, bright-colored eyeshadow, highlight, contour and fake eyelashes. The colors and products an influencer may choose to use aren’t necessarily based upon what “flatters” their skin tone, skin type & facial structure. Instead, the influencer’s focus is on testing and reviewing new consumer products, with a large advantage for being the first to do so. For this reason, it’s unlikely an influencer will showcase the same products often. Professional makeup artists tend to create looks that are simple and “flatter” their client’s unique skin tone, type, and facial structure. Typically, their goal is to enhance natural features and bring life to the areas that need a boost. Most artists work in sections of the face and apply the product only where necessary. The number of products they use and the amount they apply is often kept to a minimum. A good artist has a deep understanding of color theory and knows which colors (and products) will work best on a client. For this reason, flash palettes and multi-purpose products are popular among artists and help maximize space in their kits. Although artists may carry a wide range of items to suit their diverse clientele, it’s unlikely they switch their products often. Since both beauty communities have such a different take on makeup, there are often heated rifts between them. Some makeup artists feel that the influencer way of makeup is “too heavy” and goes against the color theory & application techniques they’ve learned. Because most influencer looks are full-coverage and rooted in drag technique, some artists argue that “Instagram makeup” strips the individuality away from one’s appearance. Aside from the amount of makeup influencers wear, some professional artists are also concerned with whether or not influencers have the right to be teaching makeup to others. Some feel that influencers mislead their viewers into thinking they’re professional artists and set an improper foundation for those who are brand new to makeup. Because of their training and experience with working on diverse clients, most artists feel they should be the one teaching others how to do makeup and not influencers. The most aggravating component for most professional artists is when influencers refer to themselves as “makeup artists” when they have not put in the same amount of time or training that pro artists have. As for influencers, the negative feelings towards artists can be mutual. While many look up to professional artists and respect their work, it’s easy for them to feel degraded and unnecessarily judged. Some influencers receive a lot of heat from artists for sharing their personal beauty tips, no matter if they claim to be a makeup artist or not. Because of these attacks, some influencers feel artists have an elitist approach to makeup. Some consider pro artist’s looks to be “plain” and enjoy having a unique take on makeup application & technique. Some influencers also argue that just because they’re not a certified artist doesn’t mean they don’t have the talent or the right to share their tips and tutorials. The most aggravating component for influencers is the heat they receive from pro artists. Many influencers feel the beauty world is changing and that pro artists need to lighten up and go with the flow. Of course, not all influencers and artists feel negatively towards each other. Some accept & embrace the other party and even trade tips. In fact, popular makeup companies have hired both artists and influencers to work together in the past. Whatever you believe, it’s fair to say that both parties have amazing talent and the beauty community is that much more diverse because of their presence. Feel free to let me know how you feel on the topic down below! Let’s keep it professional, though – debates are fine, bullying is not. Great post! I totally agree that the beauty community benefits from the diversity of both makeup artists and beauty influencers, and it’s so great when both work together!